Years of campaigning and careful planning have led up to this moment. The NHL Board of Directors gathered Tuesday in Sea Island, Georgia to unanimously award an expansion franchise to Seattle. "Today is a dream come true for an entire city," said NHL Seattle CEO Tod Leiweke. Approving a hockey team in Seattle makes the Emerald City the league’s 32nd team and helps open a new $700 million arena at Seattle Center. The franchise is expected to start playing in 2021, which is a year later than anyone previously anticipated. NHL Commissioner Gary Bettman said Seattle had the three necessary components to win an expansion: Committed ownership, a thriving market, and a state-of-the-art venue. Seattle also boasts an impressive fan base that reached the NHL's 10,000 season ticket deposit goal in 12 minutes. The yet-unnamed franchise will be the Emerald City's first major winter sports team since the NBA's SuperSonics left town in 2008. VOTE: What should Seattle's NHL team be called? "Today is an exciting and historic day for our league as we expand to one of North America's most innovative, beautiful and fastest-growing cities," Bettman said. "And we are thrilled that Seattle, a city with a proud hockey history that includes being the home for the first American team ever to win the Stanley Cup, is finally joining the NHL." The Seattle team evens the number of teams in the NHL's Eastern and Western conferences and creates "instant rivalries out west" between Seattle and Vancouver, B.C., according to Bettman. "Expanding to Seattle makes the National Hockey League more balanced, even more whole, and even more vibrant," Bettman said. Seattle NHL owners, including David Bonderman, producer Jerry Bruckheimer and president and CEO Tod Leiweke, will pay a $650 million expansion fee, up from the $500 million the Vegas Golden Knights paid to join the league. The NHL will also realign its two divisions in the West for the 2021-22 season: Seattle will play the Pacific, home to its closest geographic rivals like Vancouver, Calgary and San Jose, and the Arizona Coyotes will move to the Central Division. Seattle will benefit from the same expansion draft rules Vegas had. Its front office is expected to be led by Dave Tippett, a former coach who would lead the search for the club's first general manager and staff. Tippett signed on to the project because of a connection to Tod Leiweke, a major force in delivering an NHL team to Seattle. Arena investors had initially been interested in a 2020 start when the new arena is scheduled to open. However, the NHL was concerned with uncertainty in the arena construction timeline, and wanted to make sure every aspect of the franchise was ready to go. As far as a team name, the ownership group said there isn't a name picked out yet, although the group said it would listen to fan input. "We’re going to take our time," Leiweke said. "There’s a group of owners involved…but we’re going to listen to our fans." When asked if the Metropolitans, which was the name of Seattle's hockey team that won the Stanley Cup back in 1917, was on the table, Bettman said it hadn't been submitted to the NHL, and pointed out the league has a division by that name already. Beverley Parsons is the niece of Seattle Metropolitans co-founder Lester Patrick. She spoke at Tuesday's announcement: "Of course, everyone on the East Coast is so shocked to hear that Seattle won the first American Stanley Cup and I always shock people with that and give them the facts." Seattle NHL majority owner David Bonderman addressed the media after Tuesday's big announcement. He told KING 5's Chris Daniels his investment was largely due to location. "Well, I love Seattle. I went to school here, as I think you guys know. I graduated from the U. Not recently, I have to admit. But nevertheless," Bonderman said. "You know, I worked on the Space Needle in 1962. So it's what goes around, comes around. Seattle is one of my favorite cities, it's a pleasure to be here. If it was someplace else, I wouldn't have done it." There have been numerous stops and starts and different arena ideas to get to this point. The NBA infamously vacated KeyArena back in 2008. However, the NHL has long targeted the Seattle market for expansion. The league percolated ears in this latest round back in 2011, when NHL Deputy Commissioner Bill Daly told KING 5 the league had serious interest in the market. However, multiple people came and went, and ideas for arenas in Seattle, Tukwila, Bellevue, and elsewhere evaporated too. University of Washington graduate and billionaire David Bonderman, movie producer Jerry Bruckheimer, and Tim Leiweke’s Oak View Group put the billion dollar deal together for a new arena and hockey franchise. Last October, they made the presentation to the league’s executive committee of owners. That group voted unanimously to recommend the expansion application to be voted on at this December meeting. Bruckheimer shared his enthusiasm after Tuesday's announcement, "It's exciting and daunting and scary... you just want to do it right for Seattle and bring great players and great management. And hopefully pick a name where we won't get too many people mad at us." The groundbreaking ceremony for the new arena at Seattle Center will be held Wednesday, December 5, at 3 p.m.
A young hockey fan from Redmond, Washington was at Tuesday's landmark announcement in Georgia. Jaina has waited her whole short life for this announcement, "Anything is possible now." A lot about Seattle is different from 2008, when the Sonics moved to Oklahoma City. The skyline is filled with construction cranes. Amazon has taken over an entire section of the city, joined nearby by satellite offices of Google and Facebook. The amount of wealth now in the Seattle market is part of the reason Tim Leiweke, Tod's older brother, has regularly called the city "a brilliant marketplace" and one of the most enticing expansion opportunities in pro sports history. The Seattle Thunderbirds are a major junior ice hockey team based in Kent. Players range from 16 to 20 years old and the team competes in the Western Hockey League. “I think it will get more kids playing, more hockey players in the area, and hopefully more young hockey players that end up on the Thunderbirds,” he said. O’Dette was drafted into the NHL by the Florida Panthers after playing for years on other teams. 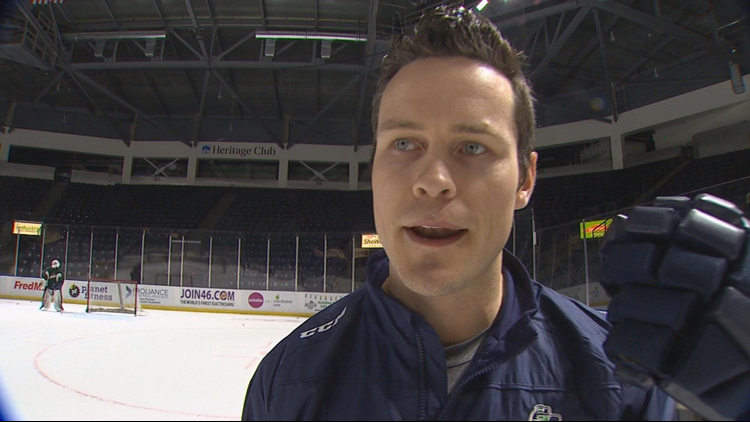 He said it’s very possible a future hometown hero of the Seattle NHL team could be currently playing for the Thunderbirds. The 2017 NHL Rookie of the Year, Mathew Barzal, played for the Thunderbirds.